Map of the Oregon Territory by the U.S. Ex. Ex. This important and extraordinary production is Commodore Wilkes' 1841 U.S. 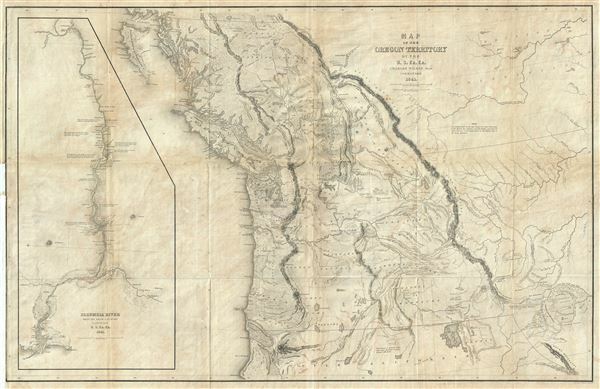 Exploring Expedition map of Oregon Territory. The map covers roughly from the 50th parallel to Mount Shasta, the upper Sacramento River, and Great Salt Lake (labeled Youta Lake) and from the Pacific to the Black Hills. It includes, either in part or full, modern day Washington, Oregon, British Columbia, Vancouver, Idaho, Utah, Nevada, Montana, Wyoming, and California. A large inset occupying left quadrants focuses on the Columbia River where the United States Exploring Expedition lost one of its ships, the Peacock, on the infamous Columbia Bar. Topography is rendered by hachure and the engravers even made some attempt to illustrate the vast pine forests of the Pacific Northwest. The Pacific Coast and the regions to the west of the Great Basin, especially the Columbia River Valley as far as Walla Walla, and the Sacramento River Valley, that were actually explored by the U.S. Ex. Ex. Those regions to the east of the Rocky Mountains benefited from the explorations of Lieutenant Fremont. These also include Fremont's South Pass located just northeast of Great Salt Lake (Youta). Fremont is credited in a textual annotation just to the east of the Rocky Mountains. Those regions between the Rocky Mountains and the Pacific explored in detail by the trapper Jedediah Smith. Smith is not specifically credited but the note 'This Country is extremely Rocky and rough, the Rivers running through Clift Rocks' is taken directly from Jedediah's map. Those regions to the north of the Columbia River extending well into modern day British Columbia. In order to offer a detailed presentation of these areas Wilkes relied on oral testimony by Hudson Bay Company trappers he met while exploring the Columbia River. These sources are tenuously credited along with Fremont in the upper right quadrant. The most likely source is John McLoughlin, a regional chief factor of the Hudson's Bay Company who proved particularly helpful to Wilkes and the expedition in general. The extraordinary detail presented, nevertheless, can be misleading. The embryonic form of Great Salt Lake (Youta) gives evidence to just how little this area was known. Other errors include the misplacement of various rivers including the Bear River, the Pitts River, and 'Ogdens or Unknown River,' among others. the southern border never ought to have been entertained, and cannot be carried into effect without great detriment to our rights, as well as of vast injury to the territory, both as regards its defense, Commercial importance, and to its ever becoming a free and independent state. Wilkes map thus places the border at the 54 40 line, extending in land as far as the Rocky Mountains, which it follows southward until meeting the current 49th parallel and extending eastward. A second boundary line, further south, also proved definitive of the future California - Oregon border. Rumsey 4442.004. Wheat, C. I., Mapping of the Transmississippi West, 1540 – 1861, #457. Hayes, D, Historical atlas of Canada: Canada's history illustrated with original maps., 199. Viola, H. J., 'The Wilkes Expedition on the Pacific Coast', The Pacific Northwest Quarterly, Vol 80, No 1 (Jan, 1898), pp. 21-31.